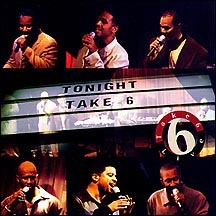 This seven-time Grammy Award-winning vocal group has finally released their first-ever in-concert recording, Take 6 Live. Capturing the sextet on stage at the Blue Note Club in Tokyo, Japan, Live features a wide-ranging and eclectic selection of songs, including such gospel standards, new arrangements of "I'm On My Way" and "Mary" and such standout tracks. The album "Going Home: A Tribute To Duke Ellington" has been released. If features songs by Take 6, Al Jarreau, and other artists. 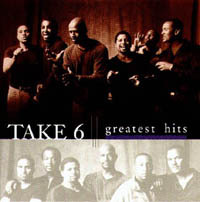 The group's next album, the first Take 6 live album, recorded recently in Japan, is scheduled to be released on April 2, 2000. The new Christmas album is now ready for ordering! You may buy it online at Amazon. The new Greatest Hits album is now ready for ordering. With songs from their debut release, "Mary", "A Quiet Place", and "Spread Love", JOIN THE BAND -- "The Biggest Part of Me," and two previously unreleased songs, the sextet pushes the envelope past what you've heard before. Their a capella groove is so unspoiled, so full of harmonic resonance, that the lyrics get that extra kick ... with or without accompaniment. Cece Winans sings with the voice of an angel on the moving and beautiful "One And The Same,"-- previously unreleased, but a shining example of what the world needs to remember. We just completely redesigned and updated the entire website. There are now hundreds of links to web pages, audio samples, music and books. All titles, including new album So Cool, can be purchased online. Please let us know your comments and additions. The band is preparing for two new album releases in 1999. One will be a compilation and the other will be new songs!